Blepharitis is an inflammation of your eyelid. It isn't an infection, and it isn't contagious. It's common and it's recurrent – which means it keeps coming back. 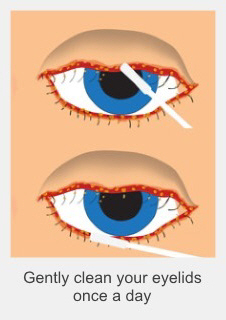 Blepharitis can be treated, but not cured, and you'll normally be able to manage it yourself. It won't affect your vision. a slight sticky discharge from your eyes in the mornings. These symptoms can keep coming back. Often, they won't go away completely, even with treatment. Even though blepharitis is mild, it can still be very annoying. In general, if you have mildly red and irritated eyes, you shouldn't need to go to the eye clinic or see a specialist. Using a combination of the following treatments, you should be able to manage the symptoms. use a cotton bud to gently wipe across the area of your eyelashes. You may want to do this while you're in the shower. This helps to stop secretions from building up, and keeps your eyelid glands more open, which will improve the irritation. Most optometrists and pharmacies sell commercial eyelid cleaners, which may work even better for you. Ask your pharmacist for advice. You can continue cleaning your eyes long-term, to stop the inflammation coming back as often and to keep your eyes comfortable. Also try using a warm compress – a warm facecloth or heated wheat bag – held over your closed eye for one to two minutes a day. If the gritty feeling and irritation doesn't go away, you can try using a lubricant eye-drop, such as Refresh, Poly-Tears or Systane. You can buy these from your optometrist or the chemist. Use the eye drops when your eye feels irritated. On some days, you may hardly need to use them, but on other days you might have to use them four or five times. If your eye-drops contain the preservative benzalkonium chloride (found in many non-prescription eye drops), then don't use them more than four times a day, as it can make the irritation worse. Don't use decongestant drops (such as the brand Naphcon) regularly, as they'll cause redness and irritation. If cleaning your eyes and using eye drops aren't controlling your symptoms, your GP and some optometrists can prescribe an antibiotic. This may be in a gel (fusidic acid or Fucithalmic), which you apply along your eyelid once or twice a day. Or your GP might prescribe an oral antibiotic, such as doxycycline, for one to three months. Young children and pregnant women shouldn't take the antibiotic doxycycline. If you try these antibiotics, you must keep using them for more than a month, as it takes this long to change the function of your eyelid glands. Once your eyelid glands stop secreting irritant oils, the irritation will settle down, and this can help your symptoms for many months. Including more omega-3 fatty acids in your diet can help to treat blepharitis by reducing inflammation and improving the secretions your eyelid glands produce. The best sources of omega-3 in your diet are oily fish such as salmon, tuna, mackerel and sardines (you need to eat two portions a week). There are some plant sources of omega-3, such as walnuts, linseed, flax oil and canola oil, although these may not have as strong an effect. If you've tried all these steps and your symptoms don't seem to be getting any better, see your GP. You may need to see an ophthalmologist for extra treatment – for example your eyelid glands may need to be manually expressed or you may need a steroid ointment. In some cases, a new treatment with intense pulsed light (IPL) might help. If your vision gets worse, or you develop severe pain or sensitivity to light, it's very important you see your GP or optometrist urgently. Written by HealthInfo clinical advisers. Endorsed by clinical director, Ophthalmology, Canterbury DHB. Last reviewed April 2018.